Successful Teams Across Borders - PART 5. How to boost team performance? 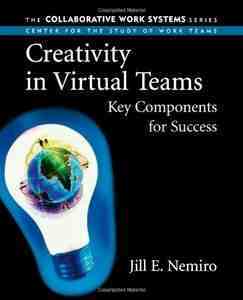 Successful Teams Across Borders - PART 4 Key Ingredients for Effective Virtual Collaboration. Meditation. Some people swim or go for a walk. I like going for a walk on my own to the forest next to my house” usually take a note book and a pen and write down the ideas that come to my mind. Jill Nemiro: I’d have to pick three, for different reasons. I really love brainstorming because it is a great way to get a team started on the path of coming up with ideas. It is exciting to be a part of a good brainstorming session, because of the synergy and building of ideas that evolves. If these sessions are run correctly, with deferment of judgment of ideas at the onset, then the “sky’s the limit” in terms of the kinds of ideas that can be generated. Mind mapping is another favorite technique of mine, because I am a very visual person. I like to see ideas, and how they connect and build on other ideas. A mind-map allows you to see this in a graphic format. And lastly, force-field analysis is a technique that I have used personally to work my way through some difficult challenges. By focusing on a particular challenge, outlining the positive factors pushing you toward the ideal and the negative factors hindering you from that ideal, and then developing actions to strengthen the positive factors and weaken the negative factors, it gives an individual or a team a way to develop concrete action plans to work through challenging situations. People will be more creative in finding resources but not necessarily in solving the actual problems. It’s important to make sure that people have the necessary information, funding and materials to do their work. People are more creative when they have a little bit of time to explore a problem, reflect on what they’re doing, gather new information, and to talk to people who might have different perspectives, which can be enormously useful. Daydream. Interested in creating your dream map- Read my post on this. 7. Everyday do something unusual – do you remember Jim Lawless” rule 7: Do something scary every day! 10. Take a break ” go for a walk!